As Shotgun Angel Games releases their first adventure module, GoblinPunk, the staff are excited to see how players use it. “We’ve loved RPG’s growing up, so getting to craft this kind of story has been a lot of fun,” James Wylder, a Shotgun Angel Games co-owner said. In the adventure Goblins have gotten a hold of steam-powered weapons, and now only a group of heroes can stop them. 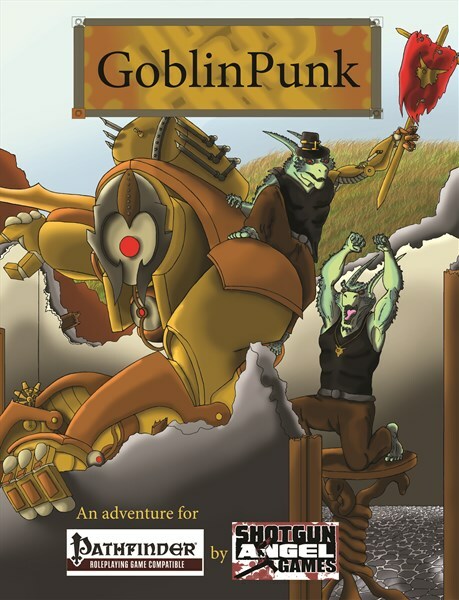 Mashing up traditional fantasy elements with imagery and ideas from the popular Steampunk movement, GoblinPunk is a unique new take on traditional fantasy. Players will encounter a wide variety of enemies, as well as their steam-powered equipment which they can acquire for their own use. Airships, mechanical monstrosities, and steam-powered ballistas are just a few of the wonders players will find in GoblinPunk’s pages. Featuring full color art by Corey Roth, fiction by author James Wylder (10,000 Dawns), and a full adventure by Damon Null, GoblinPunk was previewed in a Gen Con play session, and made using funds from a successful Kickstarter campaign.